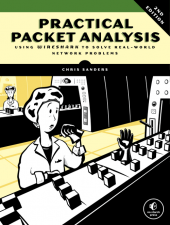 After a lot of demand, I’ve started researching content for Practical Packet Analysis, 3rd edition. There is no timeline for release yet, but for those of you who have read either of the previous editions, what would you like to see in a third edition? Specific scenarios? Additional protocols? Let me know in the comments here, or e-mail me directly at chris@chrissanders.org. Thanks!